BANDO HTS 896-8M-36 Drive Belt | Fun Cart Belt 1-20-0078 | 896mm Length x 36mm Width. 8mm Pitch. 112 Teeth. Industrial Drive Belt. Home > Synchronous Belts > One Sided Timing Belts (Single Side Synchronous Belts) > HTD Timing Belts. Round (Curvilinear) Tooth Profile > 896-8M-36 BANDO HTS Drive Belt. 896-8M-36 BANDO HTS Drive Belt. 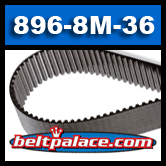 896-8M-36 INDUSTRIAL BANDO HTS Drive Belt (Heavy-Duty fiberglass cord backing). 896mm Length x 36mm Width. 8mm Pitch. 112 Teeth. Industrial power transmission belt also used on indoor/street/boardwalk Go Karts and small engine equipment. Replaces: Standard Fun Cart Belt 1-20-0078. 360-S8M-896 (Heavy Duty Synchronous Belt) ***Call for availability. GATES 896-8MGT2-36 and 896-8MGT3 36mm width. *STOCK IS LIMITED. CALL FOR AVAILABILITY! 896-8M-36 HTD Drive Belt. Standard duty. 896mm Length x 36mm Width. 8mm Pitch. 112 Teeth. Replaces: Standard Fun Cart Belt 1-20-0078.